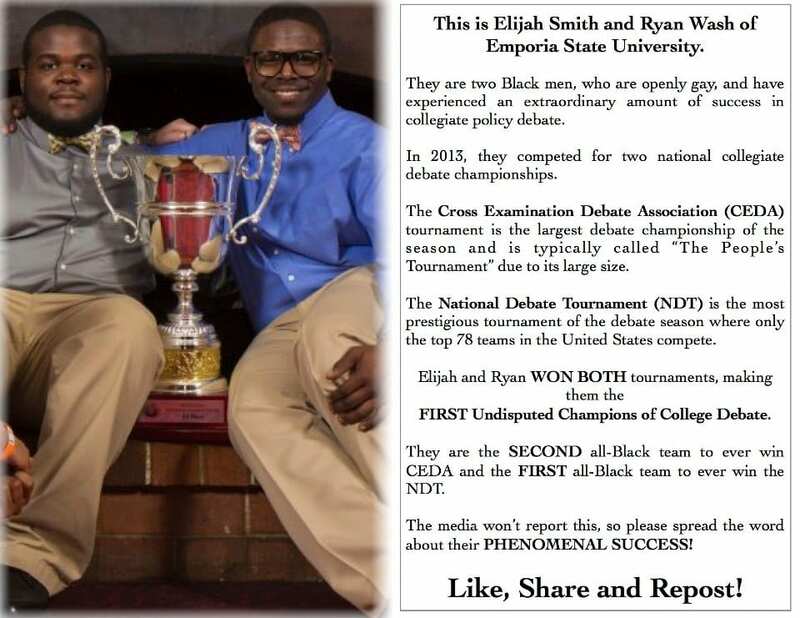 Ogden, UT–The NSD Update staff congratulates Emporia State University’s Elijah Smith and Ryan Wash for winning the 2013 National Debate Tournament (NDT) last night. Their victory is one of many firsts: Last week, Elijah & Ryan won the 2013 Cross-Examination Debate Association national tournament (CEDA), making it the first time the same partnership won both college national championships in the same season. Elijah previously debated Lincoln-Douglas at University HS in Newark, NJ, before transitioning to college policy debate at Emporia State. To the best of our knowledge, this is the first time a former Lincoln-Douglas debater has won policy debate’s premier national championship. Attempts to embed the video have resulted in site errors, but you can find it here.